In this six month special edition: We’ve spent the last several months following China in Western Canadian media. Here’s what we’ve learned – and a look forward to what’s next. Canada’s relationship with China is increasingly important, and the Western provinces are paying attention. China is Canada’s second-largest trading partner – and largest market for some of Western Canada’s key exports such as canola and wood pulp. Government ministers and other officials from British Columbia, Alberta and Saskatchewan made trade mission trips to China this year alone. For each of these provinces, trade with China represents a significant per cent of their total trade. In 2017 Alberta conducted 5.37% of its total trade with China, worth $7 billion; for Saskatchewan, it was 9.81%, worth $4 billion; and for B.C. it was a whopping 19.43% of total trade, worth nearly $19 billion. For Manitoba, 7.42% of trade was done with China, worth $2.6 billion. Meanwhile, the trade war between China and the United States has put Canada into a potentially uncomfortable position. The United States’ aggressive pursuit of a trade conflict with China and its attempts to force Canada to fall in line have pushed longstanding but muted irritants, like investment, out in the open – and on a timetable not of Canada’s choosing. There are also concerns about Chinese investment in Canada, China’s geopolitical aims and China’s human rights record. This special edition China Brief looks at what has been important in the past half year and investigates what the future will look like with China for Canada in general, and Western Canada in particular. What started as a trade spat between China and the United States has become a full-fledged trade war – with Canada caught in the crossfire between its two biggest trading partners. There have been concerns about the impact on global trade. In Canada, American tariffs against steel and aluminum – aimed primarily at China, but affecting producers around the world – have had a chilling effect on the industries in Canada. There is also rising tension over Huawei investment in Canada. On May 24, the $1.5 billion sale of Aecon Construction, a company with headquarters in Calgary and Vancouver, to a Chinese state-owned company (China Communications Construction Company, aka CCCC) was blocked by the federal government on national security concerns. While this move was widely applauded in Canada, Chinese authorities condemned it as based on prejudice towards China. While not widely covered in Canadian media, the fallout from China’s plastic import ban continued. 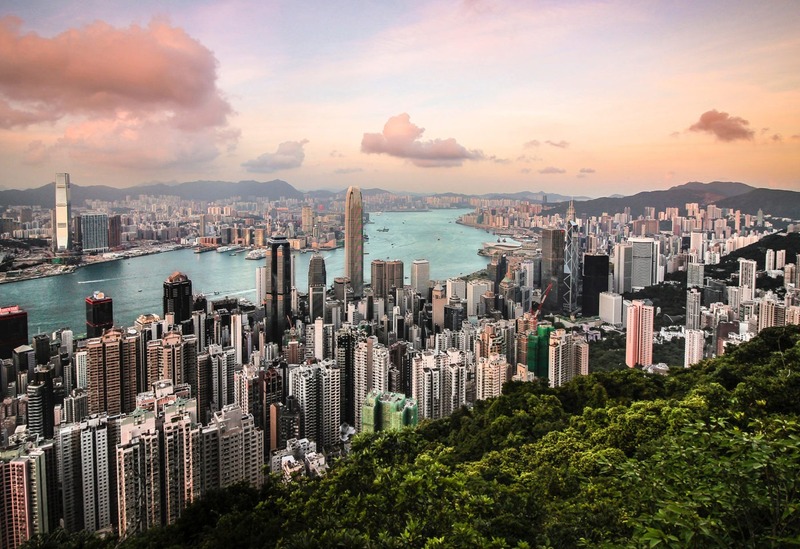 On January 1, China implemented a ban on plastic import waste that has a higher contamination rate than 0.5 per cent – a very difficult purity level to achieve. This has global implications: since 1992, China has imported 45 per cent of global plastic waste. One study indicates that by 2030, there will be 111 million tonnes of plastic waste that will have nowhere to go. With Canada still struggling with what to do with the plastic recyclables, the effects are sure to linger. Of particular interest for Western Canada is the massive LNG plant that’s been approved in Northern B.C., which will have the ability to export to China. (In fact, one of the investors in the project is PetroChina Company, a Chinese state-owned company.) A potential investment in Alberta by Chinese energy companies could pay dividends: in September, two Chinese companies and a group of Alberta Indigenous communities have a proposal to build a new bitumen refinery and have started pursuing the permits. If built, the refinery would be the second-largest in Alberta. China has criticized this clause as “dishonest behaviour” from the U.S., and sees it as another attack from the Americans in their trade war. The Canadian government, meanwhile, argues that the clause does not impact Canada’s trade sovereignty. However, there have also been signs that Canada is not looking to officially open trade agreement talks with China anytime soon. This clause will inevitably hang over any Canada-China trade talks. Even though Australia and the United States – two of the five members of the Five Eyes Intelligence community, which also includes the United Kingdom, New Zealand, and Canada – have barred Huawei from conducting business in their countries, the Canadian government has decided not to follow suit. It is possible this will change, given the pressure that Australia, and particularly the United States, are putting on the federal government. Several sectors important to Western Canada will likely suffer collateral damage due to the China-U.S. trade war. For example, agriculture has already come under pressure, and, as the sector is important to both countries, tariffs will likely continue, affecting global markets. Canada’s place in the trade war is going to matter more and more – and navigating between the two global superpowers will become increasingly challenging. 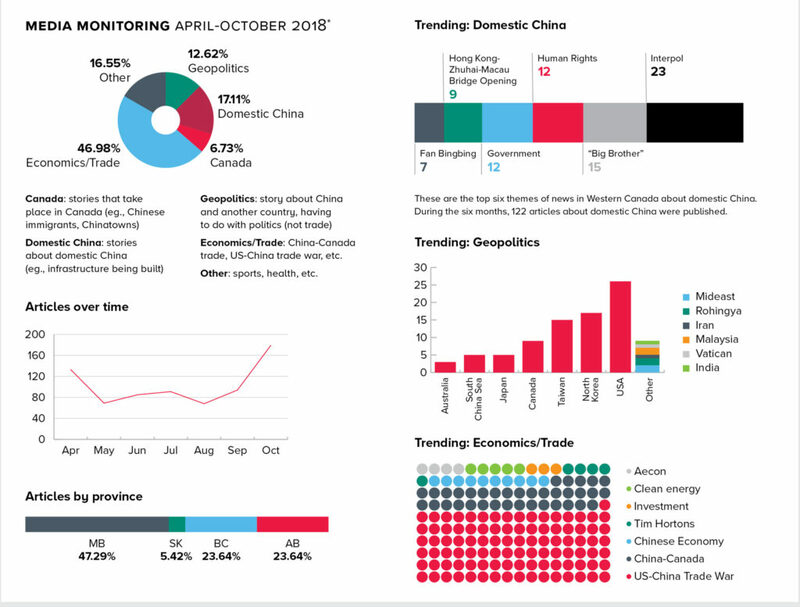 Across Western Canada, a total of 721 articles were published about China between April and October. Economics/trade stories dominated coverage in Western papers far more than any other topic; of the economics/trade stories, the U.S.-China trade war was the most popular, with 28% of all stories published. The second largest category of story was about domestic China itself, something I found surprising. The stories were quite varied, but there was a tendency for stories to be published about China’s government and sophisticated surveillance of its population. Several stories were published about Fan Bingbing – who was until very recently one of China’s most popular movie stars – after she disappeared for a couple months and then was publicly charged with tax evasion, her popularity plummeted. Human rights stories received little attention. This was also surprising. For a topic that figures so prominently in our discourse on China, 12 articles – about 1.7% of the total – seems very small. Another surprise was the lack of discussion of China and Canada at the geopolitical level (10% of all geopolitics articles). * Newspapers published in Western Canada that have 200,000 or greater circulation were consulted for this. Each newspapers website was visited, and articles were pulled and categorized manually. Newspapers: Calgary Herald, Calgary Sun, Edmonton Journal, Edmonton Sun, Regina Leader-Post, Saskatoon Star-Phoenix, The Province (Vancouver), The Times- Colonist (Victoria), Vancouver Sun, Winnipeg Sun, and the Winnipeg Free Press. What do you think is the most important thing people should know about the Western Canada/China relationship? The critical issue for both the private sector and government is management of our trading relationship with China. As the second largest trading partner for each of the western provinces, China requires constant focus and investment of political resources regardless of whether we are engaged in formal talks for a broader comprehensive trade agreement – a concept that needs to be clear to the public, policy-makers and most importantly, politicians. While article 32.10 in the just renegotiated North American trade agreement will complicate direct talks for a comprehensive agreement, it will not affect talks to manage specific or sectoral aspects of the trade relationship, with the obvious exception of any discussions to lower tariffs. But for those areas of trade where tariffs are already low or where Canada already has significant market share, sectoral agreements on specific issues arising from non-tariff barriers in phyto-sanitary procedures or tourism can prove more important and useful to simply better manage existing trade than to grow trade. The clash over blackleg two years ago in canola makes that point. China has an outsized influence on Western Canada’s economic prosperity, more so than some realize. For example, several of Canada’s largest exports to China come mainly from Western Canada. In 2017, Canada’s two largest exports to China – canola and chemical woodpulp, exports worth $2.6 billion and $2.4 billion respectively – would have almost entirely come from the Western provinces. China is each of the Western province’s second-largest trading partner, although the importance of China for each varies. British Columbia exports the most to China – 15.46% of total exports in 2016, $6.9 billion. Saskatchewan is a close second, with 12.34% to China, $3.5 billion; Manitoba exported 10.04% of its goods to China in 2017, $1.4 billion, and Alberta exported 3.88% of its goods to China, $3.9 billion. While its economic growth has slowed over the last 10 years, China has been making unilateral domestic reforms shifting away from an export-reliant economy to one that is characterized by services, higher value-added manufacturing and consumer-oriented growth. The shift aligns with its growing middle-class population that demands higher product quality, safety and standard of living. Goldman Sachs estimates a current working population of 770.4 million in China, with 146 million middle class workers (11%) and 236 million blue-collar, migrant workers who have moved to cities to find better paying jobs (17% of 1.386 billion population). This is compared to 146 million working population in the U.S.
Made-In-China2025 is China’s industrial policy that signals its shift to improve domestic innovation capacity in the high-tech sector and become a “manufacturing superpower.” The policy signals foreseeable cooperation between Western Canada and China in areas such as education, technology under the smart-agri-food cluster and Liquefied Natural Gas, to name a few.